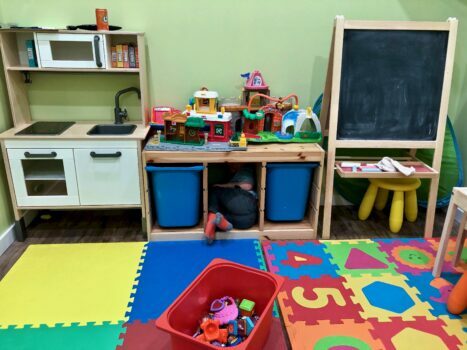 Recently I had the chance to check out One Hot Mama Salon & Spa which offers a much-needed service for parents – childcare! 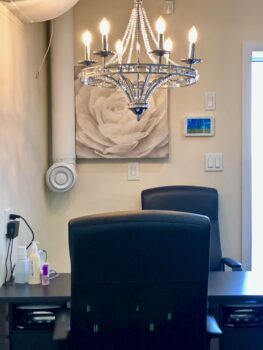 One Hot Mama is owned & operated by Amanda Siltala who is a single parent and knows the importance of having a place in Edmonton where you can enjoy salon and spa services but also have a place for your kids to hang out too. Amanda herself is the hair stylist at One Hot Mama where a variety of salon and spa services are available. 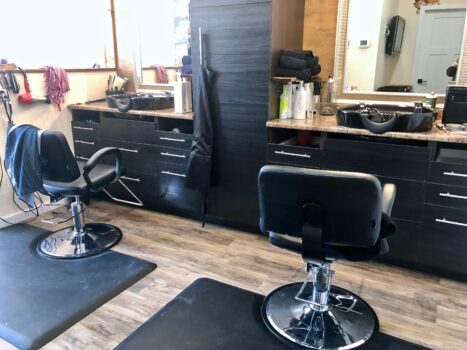 These services include hair cuts for the whole family, styling, colours, hot shaves, manicures, pedicures, waxing and facials, as well as massages. Pricing is reasonable and priced competitively such as kids cuts which range from $12-$28 depending on the age. Deals are offered regularly and you can get all the information for staying up to date on deals at the end of this blog post. What’s even more amazing is that Amanda renovated One Hot Mama with the help of some friends to be the fantastic space that it is. 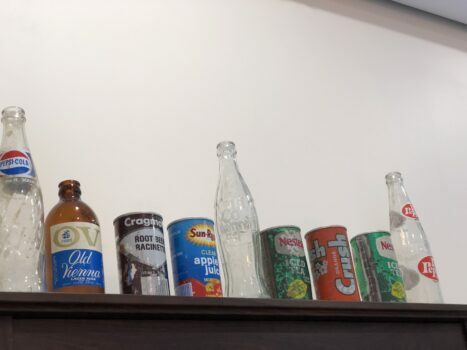 When you visit make sure you take a look at the back to see the treasures that were found during the building process. While I was there, I had the chance to experience a massage from Donny the RMT that works at One Hot Mama. Donny specializes in deep tissue and therapeutic massages however he can also customize the massage to your needs which is what he was able to do for me. Almost a year ago I slipped down our basement stairs and have been experiencing tailbone pain since then. Combine that with my not always using my computer in an ergonomically correct way and being a person who naturally carries tension in my shoulders a massage was well overdue. I left the massage feeling rejuvenated and relaxed and have felt minimal pain in my tailbone since then. I definitely plan on going back. **A receipt is provided to you so that if your benefits allow, you can claim it. One of the things that I love is that everyone that works at One Hot Mama is trained in Child Care First Aid and CPR which is important when looking after little ones. 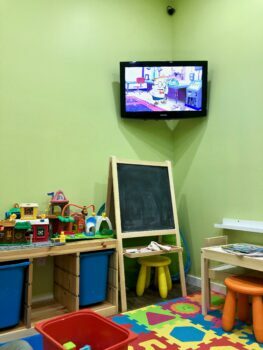 The room that children spend their time is equipped with tons of toys and lots of room to play. 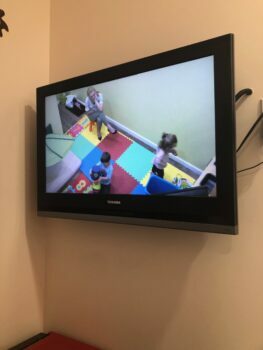 What’s also amazing is that there is a camera in the room that shows on a TV screen right outside so that you can check on your kids but they won’t see you. The cost to book childcare is $5/hr per child for the first child, $4/hr for the second child, $3/hr for the third child, and $2/hr for additional children. 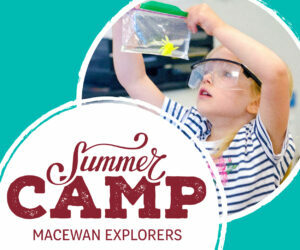 Way more affordable than hiring a babysitter, and your children are occupied throughout. 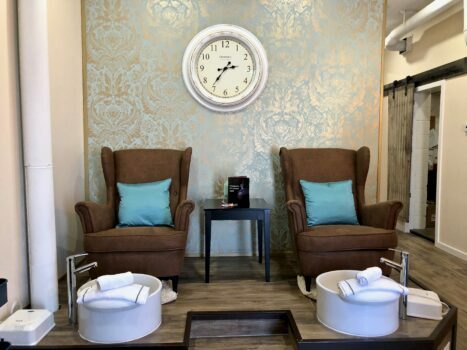 To learn more about the services offered at One Hot Mama Salon & Spa or to book an appointment with (or without) childcare visit www.ohmsalonandspa.com. Also, be sure to follow them on Facebook & Instagram to stay up to date on events that they host such daddy/mommy & daughter hair how to or current promotions. This post was created in partnership with One Hot Mama where I received products & services in exchange for a review.